Beckoning a simpler time, this spacious home plan exhibits Colonial flair in its impressive facade, but also features a modern and completely unique interior. Perfect for entertaining, this home welcomes guests through a striking front porch with columns, metal roof and lovely transom accenting the front door. Inside, columns define the dining room and foyer, and spill into the great room. The breakfast room is exquisite, even for casual meals, featuring a vaulted ceiling and bay window. Overlooking the house plan's rear porch, the breakfast room also accesses a rear screen porch with fireplace. 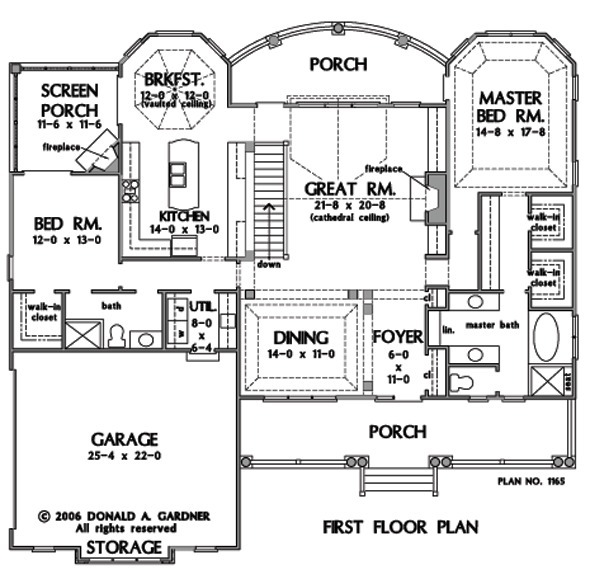 On the opposite side of the home is the elegant master suite with a tray ceiling and bay window. Two walk-in closets provide space, and his-and-hers vanities allow convenience. The lower level of this home plan includes a sprawling porch and two bedrooms, each with their own bath, and a rec room complete with fireplace. 1st Floor: 2056 Sq. Ft. 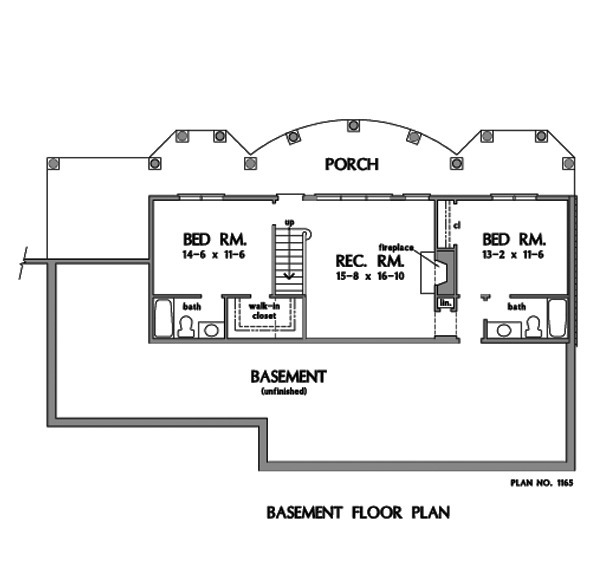 Unfinished Basement: 981 Sq. Ft.
House Dimensions: 64' 0" x 59' 8"
Great Room: 21' 8" x 20' 8"
Basement - Unfinished 1 : 36' 4" x 14' 6" x 9' 4"
Bedroom #3 : 14' 6" x 11' 6" x 9' 4"
Bedroom #4 : 13' 2" x 11' 6" x 9' 4"
Breakfast Room (Vaulted): 12' 0" x 12' 0" x 9' 0"
Dining Room (Tray): 14' 0" x 11' 0" x 9' 0"
Garage : 25' 4" x 22' 0" x 0' 0"
Garage Storage Bay : 10' 0" x 1' 4" x 0' 0"
Great Room (Cathedral): 21' 8" x 20' 8" x 0' 0"
Master Bedroom (Tray): 14' 0" x 17' 8" x 9' 0"
Porch - Rear : 24' 4" x 9' 4" x 9' 0"
Porch - Front : 38' 0" x 7' 10" x 0' 0"
Porch - Screen : 12' 4" x 12' 4" x 9' 0"
Porch - Other #1 : 51' 8" x 9' 4" x 0' 0"
Rec Room : 15' 8" x 16' 10" x 9' 4"